Whether you’re naturally drawn to purple or you’re mystified by this bold color, there’s no denying that it holds an impressive amount of power. 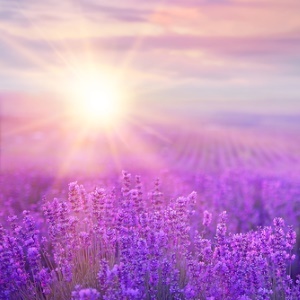 Learn more about the power of purple and how you can make the most of this color’s energy. All primary and secondary colors represent one of the seven chakras, and purple is no exception. It’s linked with the crown chakra, or the Sahasrara, which is situated on the head. From there, it connects to the brain and nervous system, which means it’s closely connected to thought and consciousness. As such, purple has strong links to sacred elements and spiritual practice. In some religions and sects, leaders wear purple robes and sashes to denote their spirituality and the importance of their role. Even in secular contexts, however, purple still has a sacred connotation. Wear purple as an aid for meditation and centering your thoughts. Given its close connections to the brain and the thought process, it’s no surprise that purple also represents creativity and playfulness. For millennia, purple has stood for both imagination and individuality. When used in excess, purple can signal idealism and impracticality. It can even point to flights of fancy and eccentric thought patterns. The ideal balance of purple can suggest inspiration and ingenuity, but too much can have a negative connotation. Talk with an authentic psychic for suggestions about harnessing purple’s creative energy without overusing or exploiting this color. When it comes to the power of purple, balance is essential. After all, this shade also suggests both harmony and stability because it regulates mental and emotional cycles. That means purple can aid in mental stability, mind-body equilibrium, peace of mind, and overall balance. If you’re seeking a better balance between thought and activity or between spiritual and physical worlds, it’s in your best interest to keep purple close. Since purple tends to be such a measured color, it follows that this hue has connections to intuition and compassion. When you wear or hold purple close, you can deepen your sense of empathy, develop natural compassion and kindness, and encourage feelings of unconditional love. For guidance on these sensitive topics, chat with a psychic online and learn more about how to embolden compassion, understanding, and enduring support. In nature, purple is relatively rare. While you might spot some lavender flowers, purple crystals, or violet-fringed leaves, this shade is less common than most other colors of the rainbow. At the same time, it’s one of the most striking and memorable colors. That’s one of the reasons purple has long suggested both royalty and dignity. In fact, in ancient Rome, only emperors could wear purple. When you wear purple today, you have the power to demonstrate control and command respect. From creativity to harmony to royalty, purple possesses a number of desirable powers. Capture its energy and keep it close by wearing purple clothing or violet gemstones like amethysts, quartzes, or tourmalines. Click here to discover all the colorful articles in our series: The Power of Color.